Hey, I realize that not all my readers have a lot of time to glam up, or may not be comfortable with contouring, blending, WHATEVER. We all have different skill levels when it comes to makeup, so I say whatever works for you is best! I had a ton of colors to choose from, but I kept going back to ONE over and over! I chose a breathtaking blue with incredible richness and dimension. It's called Abyss and it's STUNNING. but it did not photograph very well. Thanks so much for stopping by! I truly love it when you do! P.S. Stay tuned... I've been working on a huge project, and there will be more info coming up on that soon! I love the litte addition of the gem! Very cute. Thank you Robyn! I wish it photographed better :-( Maybe next time. Aww thanks!! So sweet!! xoxo! Thank you Svetlana!! Of course! love u in blue i think youve done a look simiar too this and its amazingggg ur hair and the blue are so perfect!!! GOOD MEMORY Jessica!! I did a matte blue look with Sugarpill!! I must say I'm drawn to it... :-) THANK YOU!! xoxo! oh my gosh, this is such a beautiful look Colleen! absolutely love that shade of blue - well done! Thank you sweet Ariel!!! I LOVE this blue!! Hi! I'm a blogger from Spain. I've recently found your blog and your looks are absolutely marvellous!! Please, could you tell me which colour you use for dying your hair? It's fantastic and it's very near to the one I'm wearing but better. It may be a 8.53? Hi!! Thank you!! You are so sweet! You are so sweet! Of course :-) Same to you! Thank you! That looks really beautiful, such a deep color. Love it. Avy, I am so honored by your comments. Honest. I adore your blog. ADORE. Seriously, though...I've looked at this look about 12 times this week on my phone, and I hate commenting on my phone because it pretty much never goes well. So here I am...finally at a keyboard...and loving this look for the 13th time this week. I LOVE this shade of blue...just LOVE it. Love it. 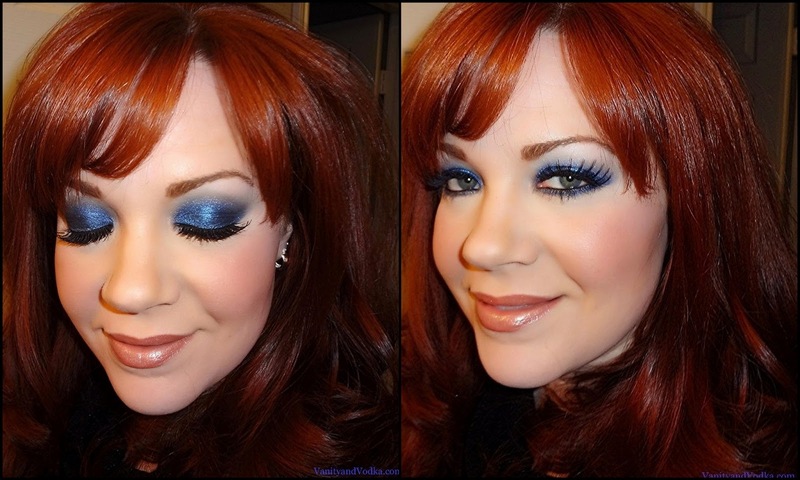 I used to do a similar blue look with UD's Radium all the time...(though I think this shade is a tad darker/deeper than mine)...and this just makes me want to get that blue out and play with it. Fabulous!! First. Regardless of the face you make. you are indeed in every way adorable, therefore- take 5 years to comment... You are THAT cute. Lovely colors :), looks soo chic! Thank you, Ellie! Of course! You totally rock Blue shadow! !